You'll be making music by playing the piano-like keys on your keyboard. I use the expression "piano-like" because these keys look like piano keys, but they won't feel like piano keys. They will feel much more like accordion or organ keys. The keys can be "touch sensitive", an option you can turn on or off, which means the harder you strike a key, the louder will be the sound produced. But this is a control that you can set and you will be able to play relatively loud music with a light touch. Piano players may be used to "pounding" the piano keys, but you won't have to do that on these keyboards. You have 66 keys, which counts both the black and white keys. There are 12 keys in an octave, from C to B, and your keyboard has 5 octaves with the lowest (low notes) being on the left and the highest (high notes) being on the right. The keys, of course, correspond to music notes and have names -- C, D, E, F#, Ab, etc. They also are identified by numbers. The lowest octave keys are identified as C1, C#1, ..., B1. The next octave is labeled C2, C#2, D2, ..., B2 and so on up to the highest key, C6. C3 corresponds to "middle C" on the piano, that is, the C located in the middle of a piano keyboard. See the figure below. An arranger keyboard is distinguished primarily by the fact that it includes preset "styles" that automatically accompany the performer while playing a song. These styles are triggered by the performer playing a chord, which the instruments in the style follow. That chord can be triggered by pressing a single key for the chord, i.e. "C" would mean the C-major chord. Alternatively, the player can trigger the chord accompaniment by playing the actual notes of the chord (for example, C - E - G for the C-major chord). But how can you indicate chords by playing keys and also play the notes in the melody of a song? The player accomplishes this by playing the "chord" with the left hand and the melody with the right hand. The keyboard, of course, doesn't know which "hand" you are using so you have to logically "split" the keyboard into two parts - one for your left hand, and the chords, and one for your right hand, and the melody. Initially, that "split point" is set at F2#. All the keys from C1 up to F2# are used to finger the "chords" needed by the accompaniment. The keys from G2 up to C6 are used to play the melody. If you are using the accompaniment feature of this keyboard, this is how you would play the keys. However, you do not have to play with the accompaniment feature ON. Look on the left side of the top panel of your keyboard and notice the button marked "ACMP". That button turns the accompaniment feature ON and OFF. For now, to focus on the voices in your keyboard, make sure that button is OFF as you try out some of the keyboard instrument voices. In the next chapter, we examine styles and will turn the ACMP feature ON and explore your options there. On the right side of your keyboard, you will see a series of buttons for selecting voices and for turning voices on and off. The figure below shows these buttons for the Tyros3, the PSR-S910, and the PSR-3000. As you can see, they look a little different, but they all contain the same basic parts. The biggest difference is that the Tyros models have three right hand voices while the mid-level arranger keyboards only have two right-hand voices. The buttons on the bottom, labeled "PART ON/OFF", are used to turn individual voices ON or OFF. If the voice is ON, the button will be lighted (as on the Tyros) or the light in the button or above the button will be lit. If you play the keys on your keyboard and you don't hear any voices, the first thing to do is make sure you have a voice turned on! When the keyboard starts, the first Right-hand voice (R1) is normally set to ConcertGrand (or whatever the primary piano voice is on your keyboard) and that voice is ON. If the LEFT voice is OFF and the ACMP is OFF, then your entire keyboard will play that ConcertGrand voice. With the ACMP off and the LEFT voice off, that "split point" is no longer relevant and the entire keyboard plays the voice selected, in this case, a piano voice. The second right-hand voice (R2 or LAYER on some models) is OFF, but you can turn it ON and have both the R1 and R2 voices active. On the Tyros3, the initial R2 voice is set to Live! Strings so if you now play some keys, you hear both a concert grand piano and strings playing together. If you were to turn the R1 voice OFF, you would hear only the Live! Strings. Tyros owners can even add a third voice and three separate voices can be combined and all play together as the melody is played. Right above the PART ON/OFF buttons are the PART SELECT buttons. 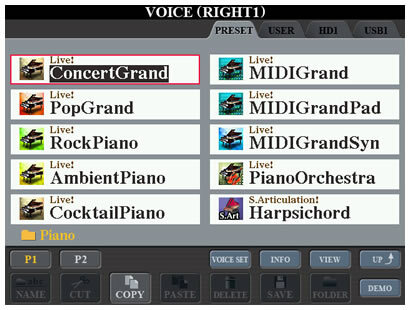 The R1 voice is the ConcertGrand piano. If you would like to select an alternative voice, press the R1 PART SELECT button (or press the "F" button next to the RIGHT1 cell). This will bring up the VOICE (RIGHT1) display screen. You can see that the preset ConcertGrand voice is currently selected. There are 9 other "Piano" voices shown. Notice the "Piano" folder name right below the last voice on the left. All of these voices are in the "Piano" folder. But there are more than 10 piano voices in the Tyros3. Look at the two bottom rows. The top one starts with [P1][P2] and the bottom row shows two available options [COPY] and [DEMO]. Each "page" in the voice selection screens can show up to 10 voices. The Tyros3 has a total of 18 piano voices. The first 10 are shown on [P1] but another page is required to show the remainder. Hence, the [P2] page. To look at those voices, press the upper  button below the screen. To go back to page 1, press the  button. To select an alternative voice, press one of the [A] to [J] buttons. If you double-click your selection, that will select the voice and return you to the MAIN screen. Alternatively, you can select a piano voice and then press the EXIT button to return to the MAIN screen. Try the PART SELECT button for R2. This brings up the VOICE (R2) display screen. Looks much like the R1 screen, doesn't it? In this case, voices are located in the "Strings" folder and the Live! 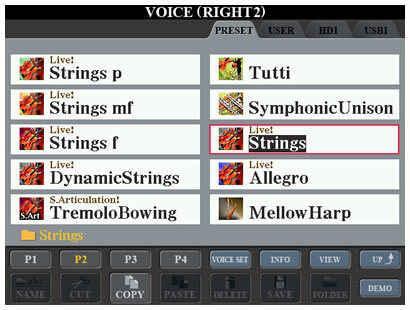 Strings voice is selected and that is located on the second page of String voices [P2]. There are 40 string voices in the Tyros3 and it requires four pages to display them all. Hence, you see [P1][P2][P3][P4] below the voice entries. Press the corresponding , , , and  buttons under the screen to go to that page of voices. Let's try one more screen since the Tyros3 has another right-hand voice. In this case, we are looking at the "Organ" folder. There are 48 organ voices in the T3 and this requires 5 pages to display them all. Because of the extra buttons found on the Tyros models (VOICE SET, INFO, VIEW, UP), there isn't room for 5 page buttons. So, you see 3 page buttons and a [NEXT] button. Press  to activate that next button and now you'll see the remaining pages [P4] and [P5]. You'll also see a [PREV] button so you can return to the first three pages. How many pages you can see depends on your keyboard model. For example, the PSR-3000 has room to show [P1] through [P5] before you encounter the [NEXT] button. Tyros3/4/5 - All of the Yamaha keyboards have a VOICE section on the right-hand side of the display screen. The voice categories available on the Tyros3 and Tyors4 are identical. Those on the Tyros5 are somewhat different. The Voice categories on the T3/T4 and the T5 are shown in the illustrations below. Note that the Tyros models can include additional sampled voices (EXPANSION category). This feature is not available on the mid-level keyboards. The Tyros3/4 GUITAR category is split into A.GUITAR and E.GUITAR on the Tyros5. Similarly the PERC/DRUM KIT category is divided into a separate PERCUSSION and DRUM KIT category on the Tyros5. They Tyros3/4 had buttons for BRASS and TRUMPET. On the Tyros5 trumpets are included in the single BRASS category. Similarly the SAXOPHONE and FLUTE/CLARINET buttons on the Tyros4 are combined into a separate WOODWIND button on the Tyros5. Finally, the USER DRIVE button on the Tyros3/4 is replaced with a button for the new ENSEMBLE feature available on the Tyros5. PSR-S950/S910/S900 - The VOICE category buttons on the S950/S910/S900 are similar to those on the Tyros models although there are fewer buttons so some of the categories are dombined (GUITAR & BASS, and CHOIR & PAD). The S950 allows the user to expand the number of voices by adding an expansion pack, an option that is not available on earlier models. 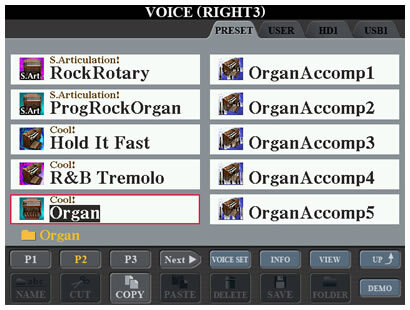 If you press the ORGAN button, you would get the same set of choices as you saw in the "Organ" folder shown in the R3 screen above. Each of these voice buttons actually represents a voice "folder" where the voices are stored. When you are looking at any of these main voice folders, pressing the upper  button to move "UP" takes you to a voice display screen showing you all the available voice folders. So, if you wanted to change the R1 voice to a saxophone, you could select R1 and then press the SAXAPHONE voice button to go immediately to the Saxophone folder and all the voices included there. Alternatively, you could use PART SELECT to select the R1 voice and, if you still had ConcertGrand, you would open the "Piano" folder. From here you could use the "UP" button to go up one level and see all the category buttons. If you use the UP button to go to the main voice category folders, you may notice that there are some voice category folders that do not have a matching voice category button. In particular, you will see folders for "GM&XG" voices and for "GM2" voices. Don't overlook these folders. If you open up the GM&XG folder, you may be surprised to see 16 additional voice folders, each of which has many voices. The GM2 folder, if your keyboard has it, will open up to 17 additional voice folders. These two folders add many hundreds of voices that you can select to play. You'll even find a SoundEffects folder included in both GM&XG and GM2 folders -- a lot of interesting sounds to try out there! Finally, notice that all of these voice selection screens have a DEMO button located below the UP button. You would trigger this by pressing the lower  button right below it. And now you can hear a short demo of the voice you have selected. Of course, you could select the voice and then play some keys to hear what the voice sounds like, but the voice demos show off the voice characteristics and give you a better idea of what the voice sounds like as well as an example of where you might want to use it. OK, you now know how to select voices. We did not show you the left hand voice selection, but it works just like all the others although it does have some additional features you will want to know about and we'll discuss that in the next lesson on selecting styles. In the meantime, feel free to explore your voices and enjoy the great sounds that your keyboard can produce.